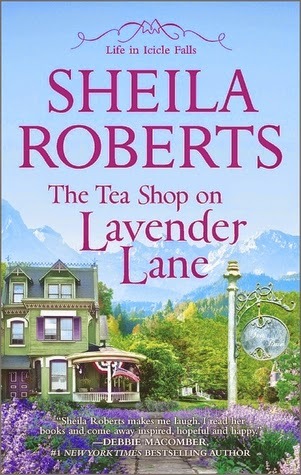 I'm incredibly blessed to be part of a hand-selected group of people to let everyone I know about Sheila Roberts' wonderfully fun books. Thank you, Sheila, for providing a copy of this book in exchange for my honest review. Additional notes: This is the fifth and latest book in the Life in Icicle Falls series. You can read my review of the first book here, the second book here, the third book here and the fourth book here. The sixth book which is Christmas-themed will be out later this year. My thoughts: In so many ways, this was the book I've been waiting for! Finally, Cecily's love life is straightened out, and I'm so happy to have a happy conclusion to that particular story line. The story starts in such an odd way - Bailey's latest catering gig turns into a disaster, and Bailey's reaction to it is pretty hilarious. It's very obvious how emotional Bailey can be. I felt, at times, like she was throwing a little hissy fit. Maybe because she's the baby in the family? Anyway, the story quickly moves forward to Bailey being home again and this is where everything picks up and becomes interesting. It was great to see all of my favorite characters in some form or another. While Bailey continued to be annoyingly emotional and spastic at times throughout the book, her personality was countered nicely by the other laid-back characters, particularly Todd Black. The book wraps up several plot points nicely, but I'm left wondering if Bailey's mom, Muriel, will ever find a new happy ending. Hopefully, this can be found in a future book! I read this book in one day, and it was a perfect book for the start of summer. It also made me want to eat anything and everything lavender-themed.